I am rarely so taken by a game’s opening moments only to have the experience almost immediately turn sour, but that’s my Dark Train experience in a nutshell. It’s a dark, visually unique work that will leave players feeling, similar to the mechanical squid they control, like a prisoner on a train going nowhere. On its surface, Dark Train offers arresting black and white handcrafted visuals making use of paper cutouts with a lived in, industrial feel. Its visual language combines the best of Lovecraftian imagery with a steampunk science fiction milieu. While on a mysterious train equipped with carriages that represent various environments like forests and cityscapes, players must solve puzzles and discover the purpose for their ominous journey. Under the surface, though, the game falls victim to one of the biggest problems point-and-click adventure games have been guilty of since their inception — it simply gives no indication of what to do next at any given time. Dark Train’s puzzles are obtuse and hidden along the chassis of the titular train, as well as within various train cars that players can enter through small ports. 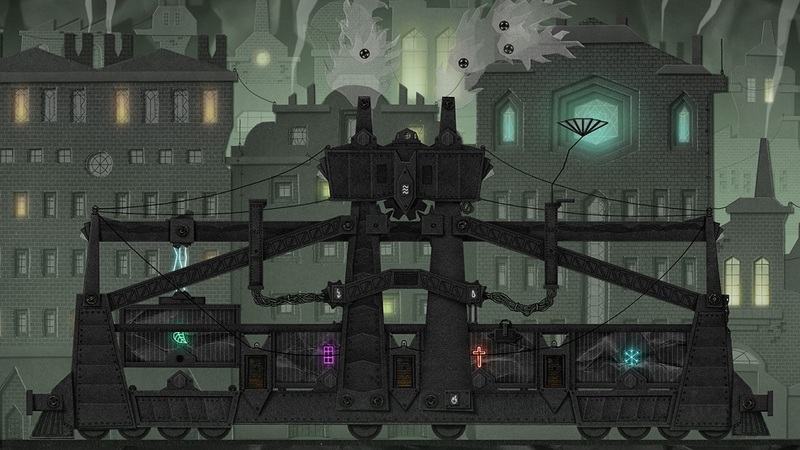 The train comprises the entirety of the game and its puzzles as it moves along tracks laid through a world populated by mechanical zeppelins and evidence of some kind of civilization that players never get to comprehend. The structure makes for a foreboding and otherworldy experience, but also one that is so abstract it makes the game difficult to understand or appreciate. In its aesthetics and minimalist user interface, Dark Train takes after its Czech counterparts, Samorost and Machinarium, both from developer Amanita Design. 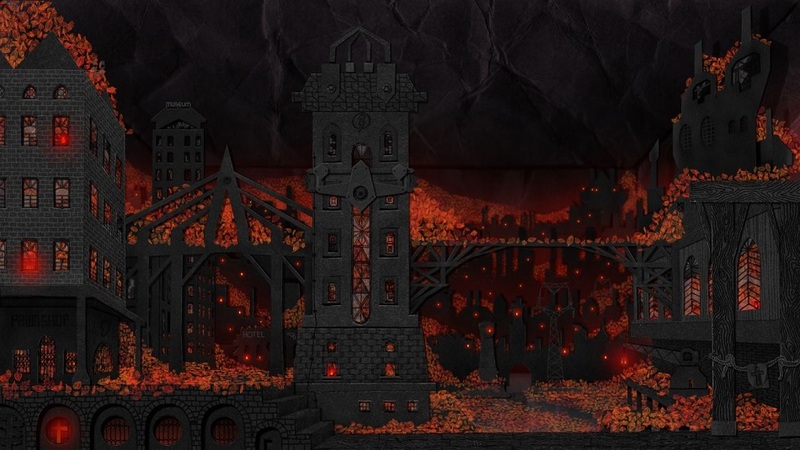 Yet unlike those games, there’s no sense of a journey in developer Paperash’s Dark Train. The locomotive almost never stops moving and players are always prisoners on it, chained in place, with the engine going around in endless circles amidst an apocalyptic environment. The controls are often horrendous, particularly during puzzles that require careful movement. The robot squid players control floats around the screen in a smooth, believable way, but it is not effective at the primary task of having to touch small buttons or items in the environment. For instance, one sequence asks players to assemble a black wreath from four pieces in a church within the train. Rather than allowing players to grab the pieces, each segment attaches and detaches from the player on a whim. The arbitrary control scheme, where any wrong movement dislodges the piece from the player, makes what should be a twenty-second sequence into several minutes of teeth grinding. This problem with movement and interactivity between the player and objects in the world is a constant irritant that could have easily been avoided with the inclusion of a grab button. Disclosures: This game is developed and published by Paperash. It is currently available on Windows and OSX. This copy of the game was obtained via publisher and reviewed on the PC. Approximately 4 hours of play were devoted to the single-player mode, and the game was completed. There are no multiplayer modes. Parents: The ESRB does not have a rating for this game. However, based on my experience, it features dark and gloomy visuals but no graphic violent or sexual content. It is probably appropriate for children nine and older. Deaf & Hard of Hearing Gamers: The game uses sound cues to give players hints, but there are no visual cues for these audio hints. However, sound is ultimately not necessary. Remappable Controls: No, this game’s controls are not remappable. But as a PC game, players can remap controls outside of the game. Shame. I love a good ontological mystery, but it’s disappointing that the concept is ruined by frustrating mechanics and a lack of direction.